If there is one word to describe In the Palm of His Hands, it is that. The amazing vocals of the brother-sister duo, Felson Palad and Sheena Palad, lift dark moods as listeners plug into the music, truth, and wonder of their newest album. What gives emotional depth to such lyrics? Felson playfully laughs while sporting a casual cap and jeans, looking nothing serious. Sheena, meanwhile, beautiful and sharp, gives the impression that everything is going cookie-cutter well with her. This momentary façade disappears as we dig into their past. Born with a fifteen year age gap, Felson acts as brother, father, and manager to Sheena. They grew up in Dasmarinas, Cavite, where fields are plentiful and naturally green. At that time, there were no malls and chaos; only local wet markets for peaceful recreation and shopping. The two lost their father to a heart attack when Felson was just twenty-eight years old and Sheena thirteen. This event, though painful, set the stage for songwriting in the life of Felson. It would take years for a single song to be birthed from this experience, but the incubation time was necessary. Like most youngsters enthralled by music, Felson formed a band with some friends in high school. One day, while rocking out his vocals, little Sheena, then only five years old and still on a milk bottle, critiqued her brother. “Kuya! Mali kanta mo!” She pointed out parts where Felson was off-key. This showed Felson that his sister was extraordinary. He couldn’t have been more right. As Sheena grew up, their church started to ask the siblings to sing duets or special numbers during worship services. This became the perfect training ground for them to sing and polish their skill with crowds watching. For Sheena, things became serious when she represented the Philippines at the World Championship of Performing Arts in Hollywood, 2016, where she ended up bagging bronze, silver, and gold medals in the categories of Gospel Broadway and Opera. She was even a New York Film scholarship awardee! Felson, meanwhile, was always nearby. He was with Sheena the whole time, managing her singing engagements and being the sound engineer for her shows. As things looked up for Sheena, Felson found himself expanding his own music career. 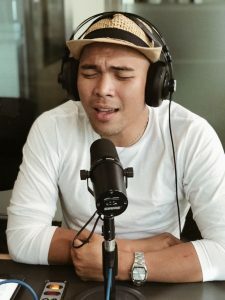 Although he had finished a degree in BS Biology, major in Human Biology from De La Salle University-Dasmarinas and had taken on “serious” jobs in the field of teaching, marketing, and school admissions, music was still a strong force in his life. In fact, it was while studying Biology that Felson honed his talents. He performed at the musical, “All for the Love of Thee Musicale: The Life Story of Monsieur De La Salle, John Baptist De La Salle,” which boosted his confidence. Did Felson always know that he could sing? Felson recounts the time when an elementary teacher told him NO, Felson, you can’t sing. He ran home crying and accused his mother for lying to him that he was a good singer. Felson was embarrassed to think that he could even sing! Undaunted, his mother enrolled him in the church choir. It was certainly a moldable time for the young singer. After college, Felson was encouraged to join the showbiz world. He joined singing contests like Pinoy Idol where he reached the Top 45th rank in the entire competition. It was during this time that Felson started to slip into a lot of drinking, entering into worldly relationships. However, it was also during this time that he found forgiveness and grace in the voice of his loving Heavenly Father who told Him that he had lost his vision for himself. Felson wisely repented, swiveled180 degrees from his lifestyle. He started to pour his energies into organizations with strong advocacies for the indigent. He wanted to use his music well. In 2014, Felson directed a concert for orphaned babies at the Home of Joy Orphanage to raise awareness and funds. He also got involved in a local mission sending foundation for the poorest of the poor called We Exalt You Jesus Foundation where he volunteered and worshipped during medical missions in different provinces in the Philippines. From 2015-2017, Felson was the event director of concerts for Brand New Day, a street children institute. The concerts were held to raise awareness and funds for street children. In 2016, he was the music director for a concert called Music for Life (with One Walker Band), where poor but academically excellent students could receive funding for their studies. Other opportunities for helping the poor came, allowing Felson to use music to benefit the community. The gift of song that Felson and Sheena carried, stretched in its influence. Someone heard the two worship leading in Israel at the 2017 Young Adult Behold Israel Tour led by Major Amir Tsarfati, and invited them to go to the United States to try out opportunities as Gospel Recording Artists. Felson and Sheena walked through this open door. A church there, the Pasadena Christian Church, became their home away from home. It is a church that is almost a hundred years old, with quaint benches and an altar set within a cathedral-designed backdrop. An old piano sits, its keys still musically sound. The people who enter the church are very diverse and multi-cultural. The racial mix of attendees breathe a welcoming air into the whole building, as rooms open to care for the homeless. Aside from worship leading at the Pasadena Christian Church and heading the youth ministry, Felson is the resident artist at the Upper Room: a Christian Coffee Shop, located at Orange County Mission Viejo California. Sheena, now an annual worship leader for the Behold Israel Youth tour, is someone who still finds her feet touching other nations. She sings around South East Asia to promote tourism in the Philippines. When outside the United States, Sheena collaborates online with her brother for the creation of songs. However, when she is in America, she tag teams with Felson during worship time. They do necessary back-up vocals for the sibling who leads. Just how wonderful are their voices? The original songs in In the Palm of His Hands carry with them a hope and grace needed by those struggling with the darkness of life. One cannot help but feel the pain and the straining of hope, that yes, there is still dawn after death. Even when things are difficult and painful; when things don’t go our way, we can raise our eyes beyond the challenges to see Him who sits on the throne. Yes, we can still be forever thankful. We can still praise the Lord. The other songs in the album are beautiful covers, one of which is, “The Prayer” popularized by Josh Groban and written by David Foster, Carole Bayer Sager, Alberto Testa, and Tony Renis. There is also a song medley originally sung by Sandi Patti, where Sheena tackles the hits “Upon This Rock,” and “In the Name of the Lord. 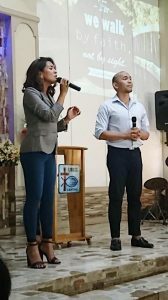 For Felson and Sheena Palad who boldly sing their praises to God, there is no doubt that they are kept safe in the palm of their Heavenly Father. The album, In the Palm of His Hands, is currently on Spotify. It is produced by the Lord of Harvest Church, and has been released to the Filipino Community at Los Angeles, Downtown California. To contact Felson Palad and Sheena Palad for their events and concerts, you can email fspalad@gmail.com.